Sarah Camiscoli, IntegrateNYC's founder and executive director, and Aneth Naranjo, Director of Youth Engagement, both spoke at the event this week along with representatives from a number of other organizations. Quartzy Covers Hebh Jamal's Feature in Teen Vogue's "21 Under 20"
In an article published in December, Quartzy pointed out the significance of those chosen to be featured in Teen Vogue's "21 Under 20" for 2017: that the magazine is turning towards presenting activists and artists over celebrities as role models for its readers. The article notes Hebh Jamal's role as one of Teen Vogue's cover stars for the issue as a part of this shift. 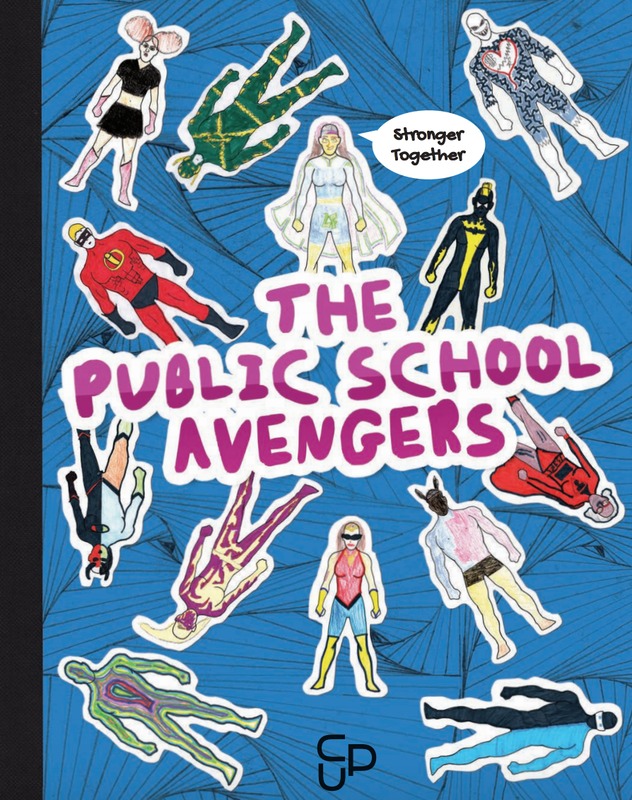 The Center for Urban Pedagogy teamed up with artist Napur Mathur and students from The Red Hook Community Justice Center to publish "Public School Avengers," a booklet in graphic novel format that creatively outlines the ins and outs of school segregation, how the system impacts students. 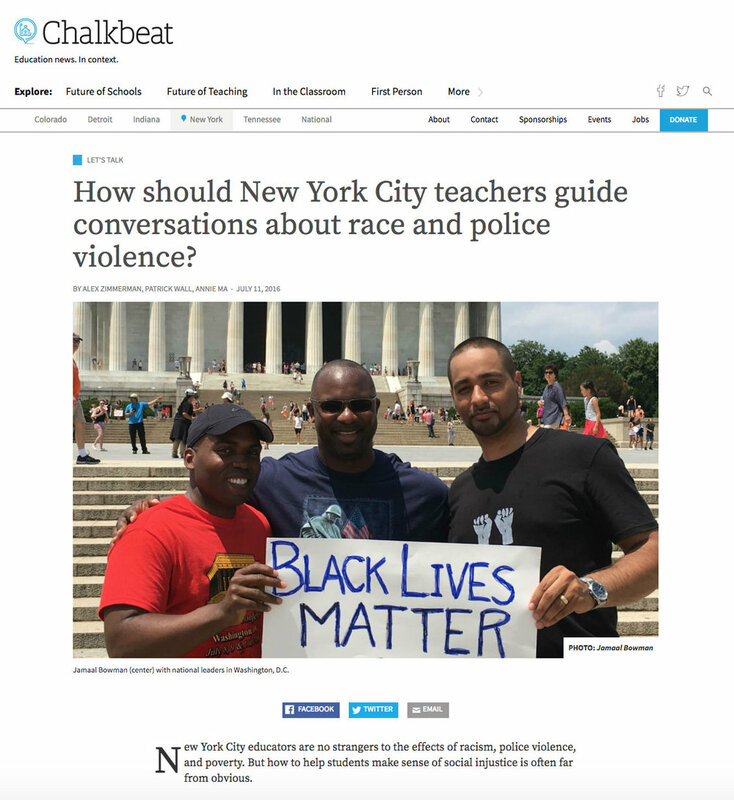 Teens Take Charge published an article written by Hebh Jamal on their website in May. Hebh writes about how her experience attending a predominately white high school on the Upper West Side spurred her commitment to ending school segregation in New York City, as well as the adversity she faced in trying to do so. So, where is “here”? A 21st-century America—not just Chicago—rife with apartheid schools that serve almost exclusively Black and Brown students, are chronically underfunded, and struggle to fulfill every student’s right to the quality education that can give them a fair shot at success. An America more interested in funding the school-to-prison pipeline than public schools themselves. An America where we spend less than $10,000 a year to educate a child but anywhere from $35,000 to $64,000 to incarcerate one. “We must love America enough to change it” – Bronx-born Hebh Jamal, 17, explains why resistance isn’t futile. Hebh Jamal made her political debut on the cover of the New York Times; since then the Bronx High School student's activism has remained impressively high profile, whether staging a strike following Trump's inauguration, being interviewed by the Observer and Broadly or talking on a panel with Angela Davis. An advocate for education since she was 15-years-old, Jamal has become increasingly active as she attempts to execute her vision for a more conscious, harmonious, educated society - regardless what executive orders Trump's government try to pass. In celebration of IWD, we asked this formidable female to tell us about her type of activism, and what she intends to do to challenge political Islamophobia. "Oppression has always manifested itself in three ways: lack of safety, vulnerability, and intimidation through a set power structure. In America, the demonisation of Muslim Americans has been perpetuated by the media, Hollywood, and government policy. What I was in fact perplexed by was this new rhetoric that is seemingly founded on oblivion surrounding the current situation of America: that Muslims are newly under attack by public officials. The reality is that we have been under attack during both Democratic and Republican presidencies. The only difference now is that this presidency aims to demonise all marginalised groups at the same time. The 74, a non-profit, non-partisan news site covering education in America, and Big Tomorrow, a multi-disciplinary design firm specializing in the creation of paradigm-shifting experiences, both highlighted the Teach Us All panel featuring IntegrateNYC as a must see at this year's SXSWedu. Check out their other recommendations at South by Southwest Education: The 17 Panels and Sessions to See at SXSW 2017 and BT’s SXSWedu 2017 Picks. "On the morning of June 8, the Department of Education held a briefing at the Dirksen Senate Office Building regarding the proposed Stronger Together program. At the briefing Senator Chris Murphy announced his intent to introduce legislation authorizing the Stronger Together program, while education experts and advocates (including NCSD member Sarah Camiscoli [Co-Director IntegrateNYC4Me] and Erica Frankenberg) discussed research regarding the positive impacts of racial and socioeconomic integration, and what can be done to foster collaborative work between local education, transportation, and housing and community development agencies."